Tired of of the typical tacos, but still craving Mexican? 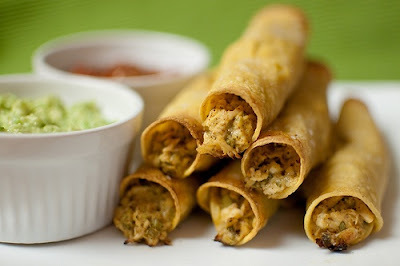 Try making these scrumptious chicken taquitos. They’re simple to make and don’t take long at all! Plus, you can even prepare and freeze them for a super quick dinner. For a simple side, accompany the taquitos with a package of Mexican rice, and you’ve got yourself a delicious Mexican meal in minutes! Combine cream cheese, salsa, lime juice, cumin, chili powder, onion powder, garlic, cilantro, scallions and ¼ teaspoon of salt in a large bowl. Fold in chicken and cheese. Add in extra salt and pepper if desired. Microwave three tortillas, stacked on a plate, covered with plastic wrap (I always just use a paper towel) for 30 seconds or until tortillas feel soft. Continue microwaving as many tortillas as desired. Use a spoon to place two to three tablespoons of filling into each tortilla, and roll tight. Place the tortillas on the baking sheet, seam side down. Bake taquitos for 15 to 20 minutes, or until they appear crisp and golden-brown. Take out of the oven, and serve with sour cream, salsa and/or guacamole. I like to dip my taquitos in melted Velveeta cheese! NOTE: You can always substitute shredded beef or steak for chicken to change up the recipe a bit. If you’re someone who’s always on the go, you may want to consider preparing your taquitos and then freezing them. Follow the directions as listed, but instead of baking, place the baking sheet in the refrigerator until the taquitos are completely cold. Then individually wrap each taquito in plastic wrap or aluminum foil, and freeze. When you are ready to cook them, all you have to do is bake them for 20 minutes at 425 degrees, no thawing required. Next time you’re looking for a quick and easy Mexican recipe, try whipping up these delectable chicken taquitos!